Kind-hearted employees from Leeds-based European lighting and automotive electrical specialist, Ring, have donated over 350 everyday essentials to the local foodbank. Requesting that people bring in cans of soup and basic ingredients including pasta, rice and potatoes, along with toiletries and household essentials, the company has organised the collection for a third time to ensure that those less fortunate do not have to go without during Christmas and into the New Year. Knowing that times are very challenging for some families throughout the Leeds City Region, Ring takes this opportunity to come together and to request that staff give something back, making a difference where it matters most. Marketing communications manager for Ring, Louise French, has been involved with coordinating the collection since it started years ago. 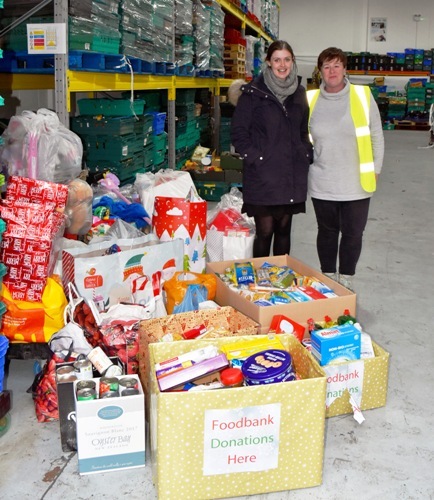 She said: “We know that there are people living within a few miles of our head office that will be worrying about what they are going to eat this Christmas and that is why we wanted to arrange a collection, so that they can look forward to a warm meal. The boxes of food will be taken to Leeds South and East Foodbank which will manage the distribution of all produce to the families that access its services throughout the festive period and into January.